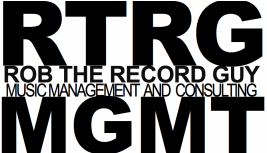 CONTACT - ROB THE RECORD GUY MGMT. Calling is great. Really. But we also have a contact form if you want to give us some more detailed info in a different manner. If you've hit this page first and are looking for management, please visit our about page. For the foreseeable future we only work with musical artists based in Chicago. Seeing someone live and then being able to talk about it in person is an important part of our philosophy.